I have been thinking about purchasing a bigger cage for my budgies to give them more space. I live in a city where bird pets aren't uncommon, yet I'm afraid there is no place around here where I can find a proper big cage for them and the purchase + shipping costs of some beautiful cages I have seen online are too much for my budget. Hence, I thought about the possibility of designing one myself. It's still an idea. There are some details that I need to think about, the materials that I need to check, plus the research that I need to do in order to not build something that could harm them. I also need to estimate the cost to see if it's actually better if I buy them a cage, but in the meantime, I would like to share it with you. 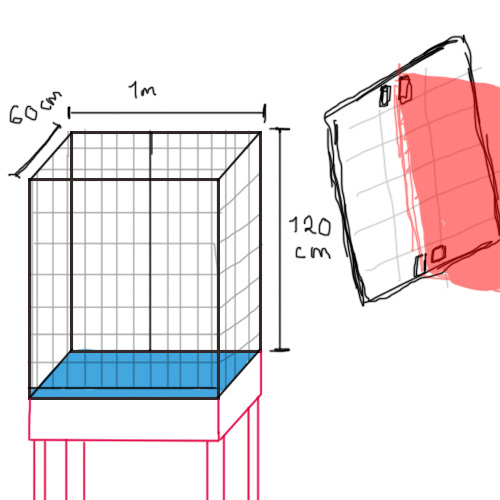 The cage is rectangular with the following measures: 1,20m (3'11''), 1m (3'3''), 60cm (1'11''). The blue thingy is basically above the floor of the cage, it's removable so I can clean it. The cage would have 4 small doors (2 at the front, 1 at each side) and the back of the cage would be two big doors that I would open only when I have to clean everything. Now, I have two female budgies, they like to visit each other sometimes, but if they are together for too long, they start to fight. I had the idea of keeping them in the same cage but have some kind of removable separation so they can spend time together, but still remain separated most of the day. For that, I have the idea of placing something at the front of the cage to maintain the separation in place (which I show at the right of the picture, the red thing would be the separation) although I have also thought about leaving a thin space at the top of the cage, so I can insert the separation right there. All would be placed in a base that has 60cm (1'11'') of height with a shelf that I would use for storage of the toys, food, etc. As for the materials, I have thought of different options. For the cage, I could use stainless steel, but I'm looking for other options. I also thought about building the base of wood and use something else, some kind of metal fabric which I will research about too. For the base, the floor and the separations, I thought about galvanized steel, but wood seems to be another good option. I guess that's all for now. I will start looking for the materials either this or the next week! I'm really excited to keep planning it, but if any of you have concerns or doubts about the cage construction, please let me know. I wouldn't like to build something that could harm my budgies, but something that they can enjoy and love as their new home. Please be sure you use metal that is budgie safe.